Floating desks can be so convenient. They provide a work space, much like a regular desk, but out of the way, thus preserving valuable space. In addition, with some desks, they are not only on the wall, but they also fold to preserve more space. 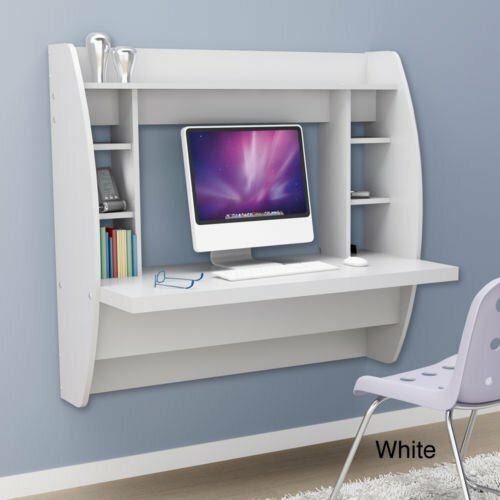 When looking for the right floating desk for you space keep in mind your storage needs as as well. Some floating desks don't have any storage other than the work area. Others have drawers and cubby holes that suit your needs. And when determining your floating desk decision also keep in mind where it's going and how to install it. In many cases you will need to have the tools available to install it properly. And if you're looking for other desk options, feel free to check out our 30 best desks for small spaces. Enjoy. A rear ?flip-up? door conceals a storage compartment for power bars and adapters. 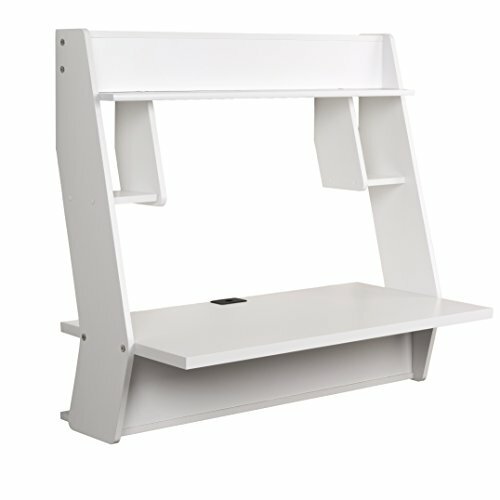 BUDGET DEAL – Edencomer wall mounted desk, directly from a SGS and FSC certified manufacturer, features melamine laminate, large work surface, side storage shelf, hidden cable&wire management, space saving design and strong package for durability without formaldehyde and meets environmental standard (P2). 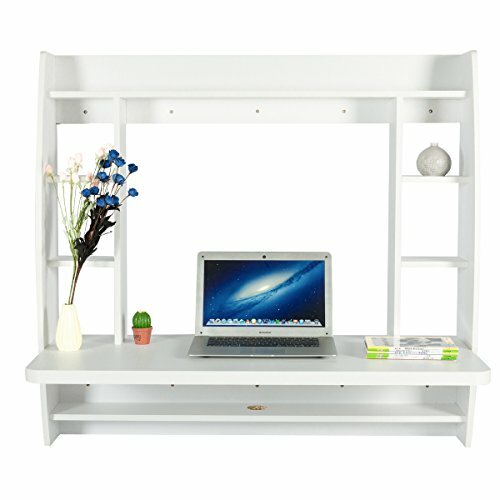 ASSEMBLED DIMENSION – The wall mounted computer desk is measured approx. 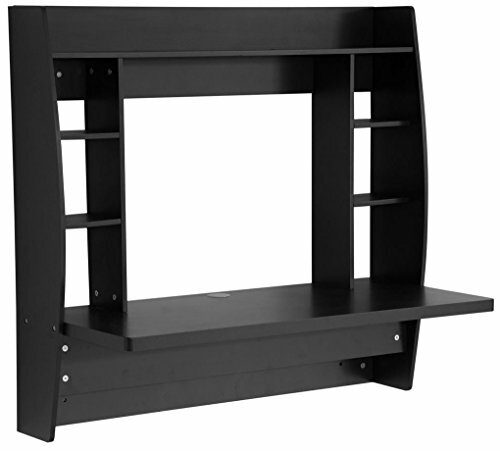 42.5″*19.7″*39.4″ (L*W*H) and weighs 48.5lb with a max support of 132lb, stable&sturdy floating stand desk. 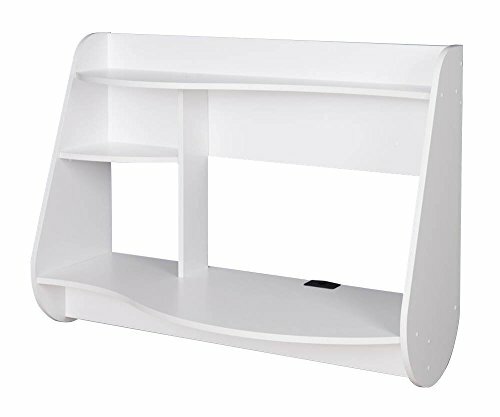 HOME MULTIPURPOSE DECOR – The modern decorative floating office desk is suitable for your office, home, or dorm room, functional storage organizer unit for PC, laptop, books, clock, lamp, dvd, photographs and etc. Table top is divided along its length in two parts, enabling either half the table depth or the full table depth to be used. Constructed from solid composite wood, this sturdy floating desk uses a hanging rail system to allow it to ‘float’ conveniently off the floor and out of the way. 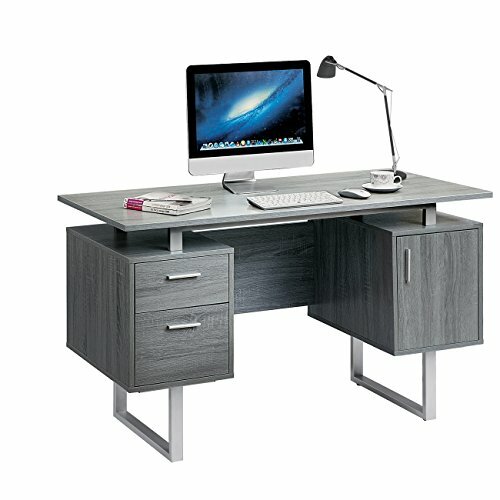 The desktop provides an ample work area, which easily accommodates a laptop, notebooks and writing essentials. The fold-down desk gives you enough desk space to work comfortably and helps you optimize available floor space when closed. 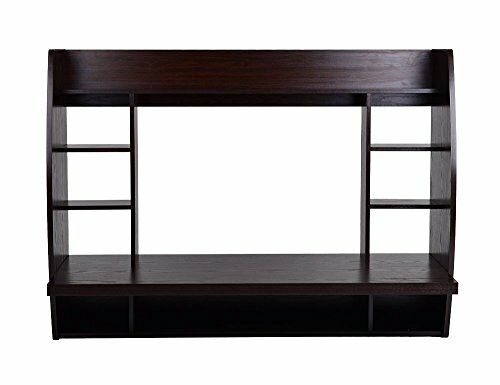 Side compartments and top shelf provide multiple storage capabilities Store books, photographs and other items on the top shelf making your table organized. 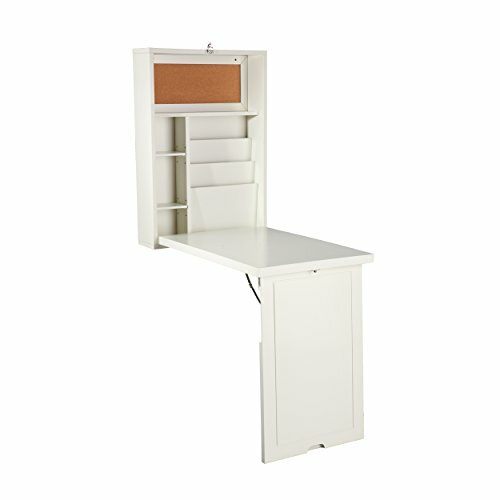 The wall mounted desk folds out to provide ample space for working, and folds up just as easily. The fold-up design makes it the ideal desk which allows you to work from the comfort of your own home. 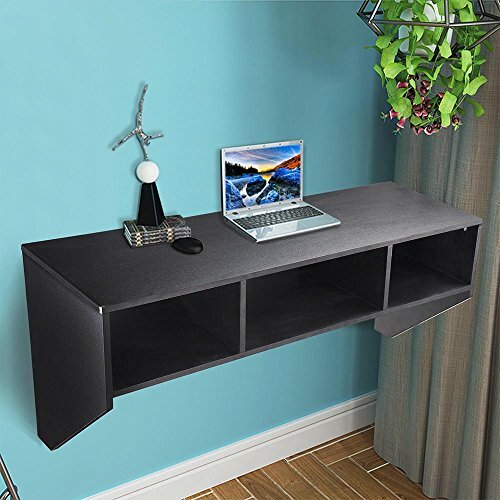 ★This floating desk saves valuable floor space hanging directly on your wall. 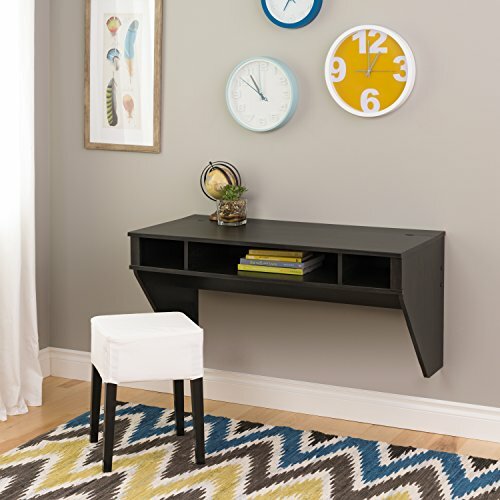 Save space and add style to your room with this floating desk. 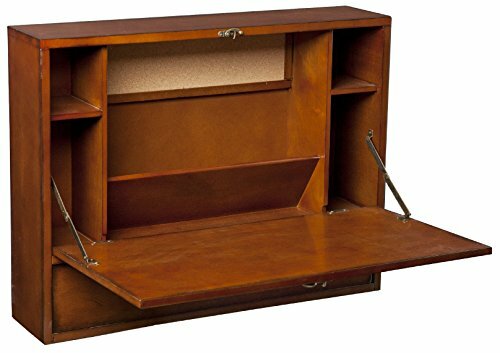 ★The desk sets up spacious side compartments that are just the right size for your important binders, books or anything personal items. ★The triple-tiered design can present and store various containers and items. 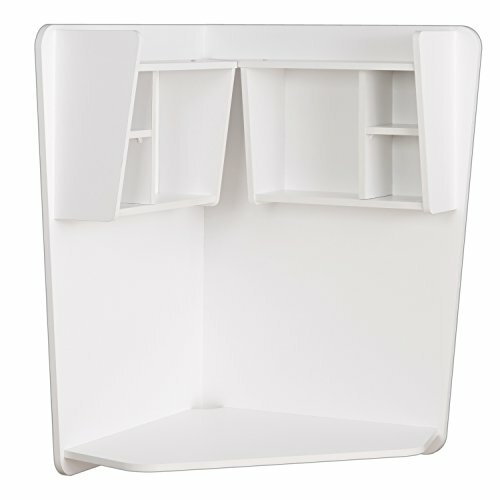 You may need close at hand with removable shelves to store taller items. 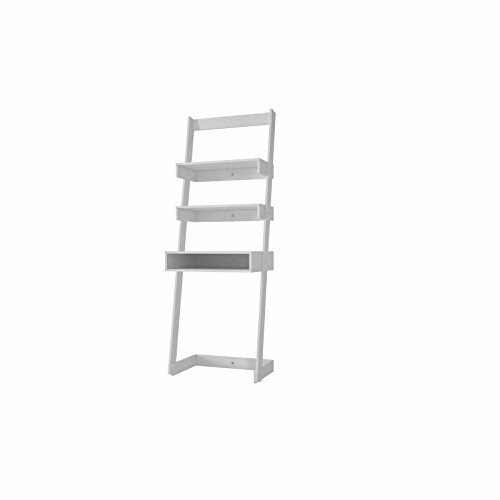 Dimensions: 24.8W x 17.72D x 69.69H in. Dimensions: 40W x 19D x 39.5H in. 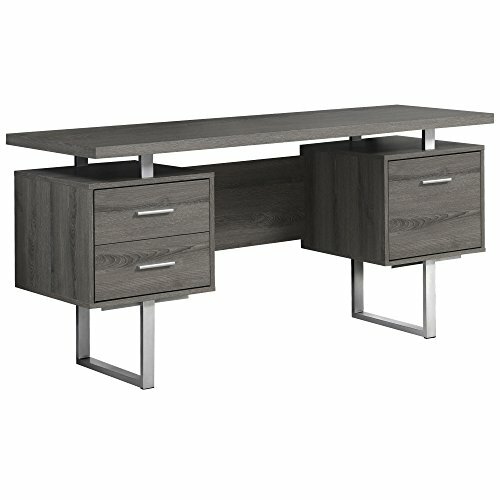 Desk dimensions: 42W x 27.36D x 40H in. Dimensions: 42.25W x 19D x 31.5H in. Dimensions: 39.35W x 19.75D x 37H in. Floating desks can be very convenient. 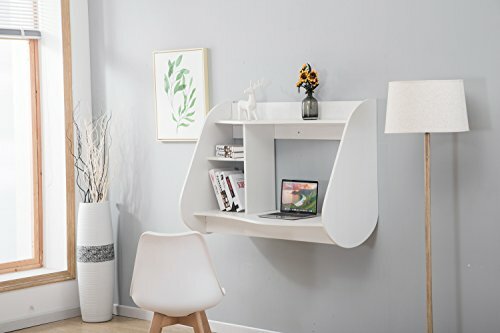 Not only do they provide the desk space you need, but especially when you don't have a lot of space, floating desks are out of the way and don't take up major real estate. And comes in handy in today's modern apartments and homes. 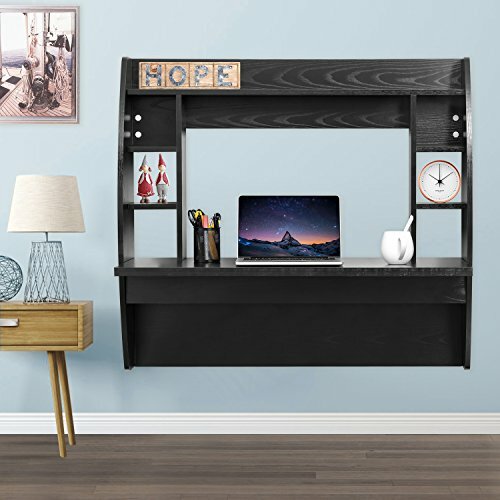 We may not always have the space for a dedicated home office, and sometimes the space in the bedroom is not enough for a desk - so a floating desk may fit the bill. 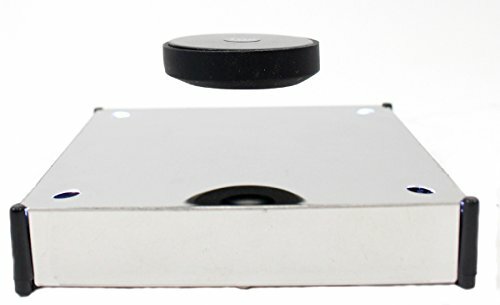 Floating desks can come in many sizes and shapes. But when they come with drawers, they make the experience all the more practical. Where there are drawers included there isn't a need to keep all papers, books and other elements on top of the writing space or on any included shelves. This can keep your desk from looking cluttered. It can also help keep projects you're working on away from curious eyes and hands. Having a floating wall desk with drawers also allows the space to be used by different ones with differing projects, allowing each to have the most available space at the ready. And if you get a large floating desk, this gives you even more real estate to work with, but having drawers also allows you to maximize this space. 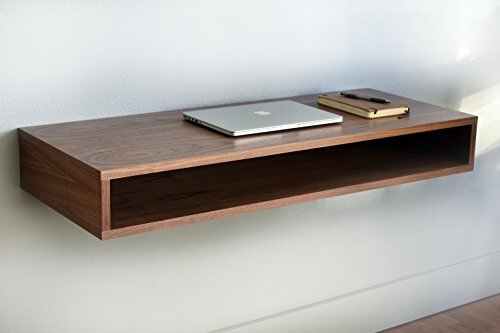 But if you buy the small floating desk variety, then drawers will definitely be a needed option. Floating fold out desks come in different flavors and different names. They've been called, Murphy desks, Wall mounted convertible desks, Drop down desks, and the like. But they all have something in common: When not in use, you can fold up and tuck them away. 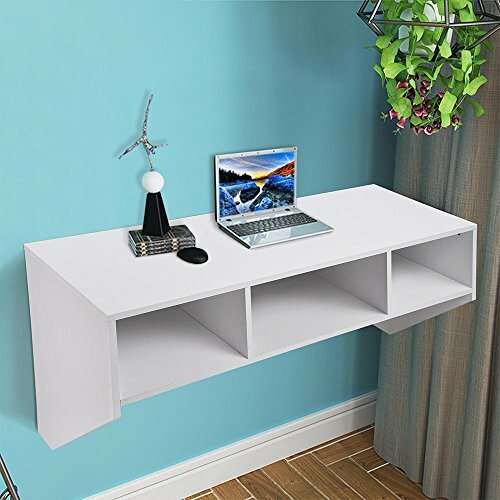 Some who have the know how (or experimental spirit), there are many DIY wall mounted projects out there - and they can even make their own DIY floating desk. 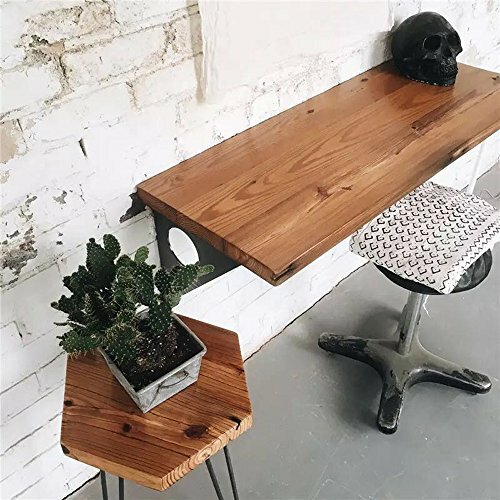 The benefits of DIY is that you can, depending on your skillset, put one together with all the elements you need - any maybe can't find in wall mounted desks you've seen in IKEA or Walmart. 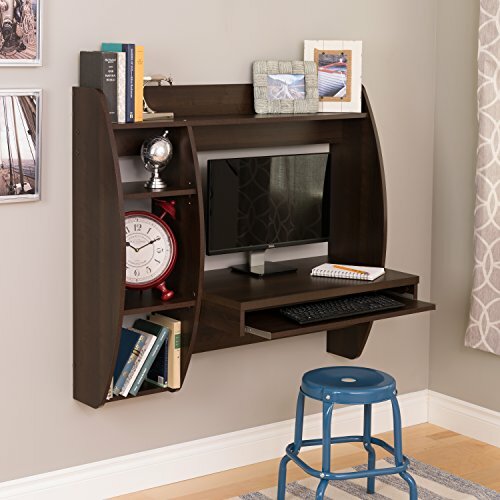 See a DIY wall mounted desk idea here. 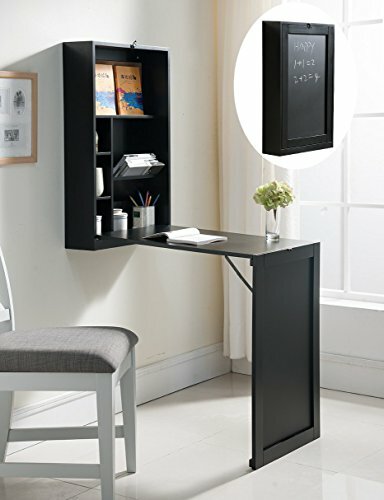 This attractive wall mounted corner desk is perfect for your needs. Floating corner desks are out of the way, practical and appealing. This one is small space friendly with a corner design that can go practically anywhere. When not in use as a desk, it can be an attractive bookshelf. 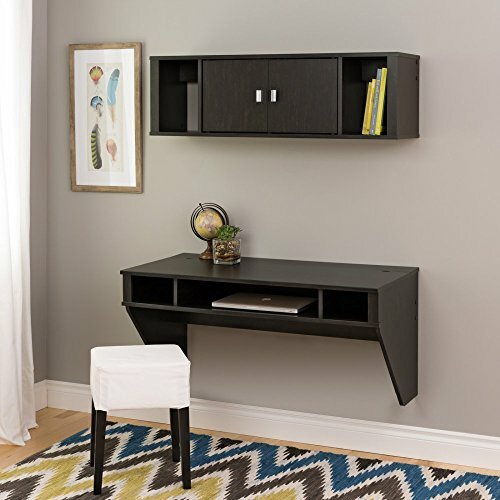 The Flacx Wall Mount Corner Desk has 2 storage cubbies, a cord management outlet in a contemporary style. The overall size is 59" W x 48" D x 10" H. There is some assembly required but the overall weight is shy of 40 lbs. 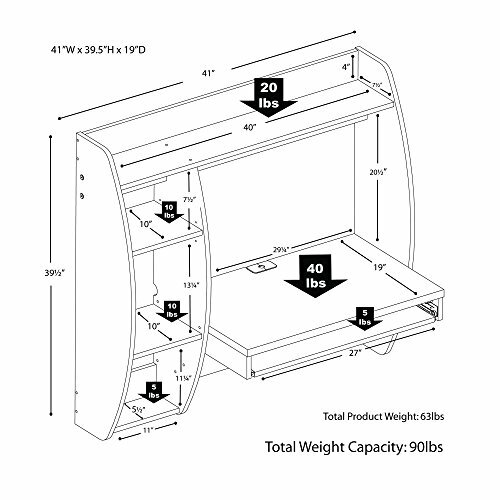 It supports up to 30 lbs (Desktop) and 5 lbs each (shelves).